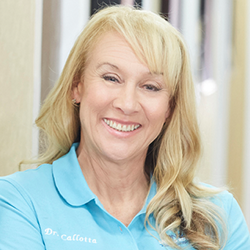 In private practice since 1998, Dr. Callotta provides a wide range of primary health care solutions. She employs a combination of diversified techniques including spinal manipulation, soft tissue therapy, rehabilitation modalities, and in-depth clinical and nutritional support and education. With an advanced degree as a Certified Chiropractic Sports Practitioner (CCSP), Dr. Callotta treats an extensive array of sports, work and personal injuries and conditions. Encouraging an active lifestyle for her patients, she focuses on individual patient needs as they undergo the healing process. Dr. Callotta designs treatment programs based on the patient’s specific requirements and goals. She was recognized as State of California – Doctor of the Year from 2007-2008.